Dutching is betting strategy involving backing all possible outcomes on a particular event. It differs from standard matched betting as you won’t be laying any selections on a betting exchange. Instead, you’ll be backing all outcomes separately across various bookmakers. One advantage of dutching is that there are no exchange commission fees to be paid, thus saving you money. It also opens up a new income stream alongside matched betting offers, allowing opportunityto increase your overall profits. 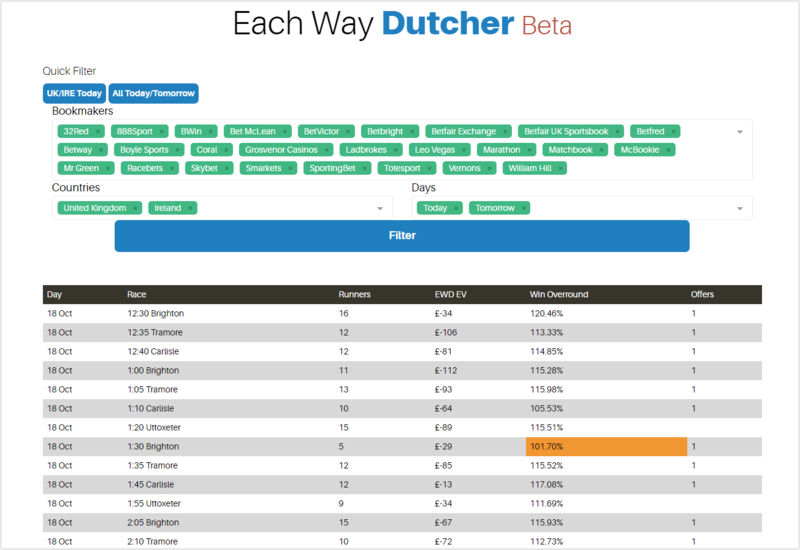 The Each Way Dutcher tool compares the odds of horses across a number of bookmakers for races taking place on any given day and displays opportunities where there is a positive expected value on races when covering the entire field. 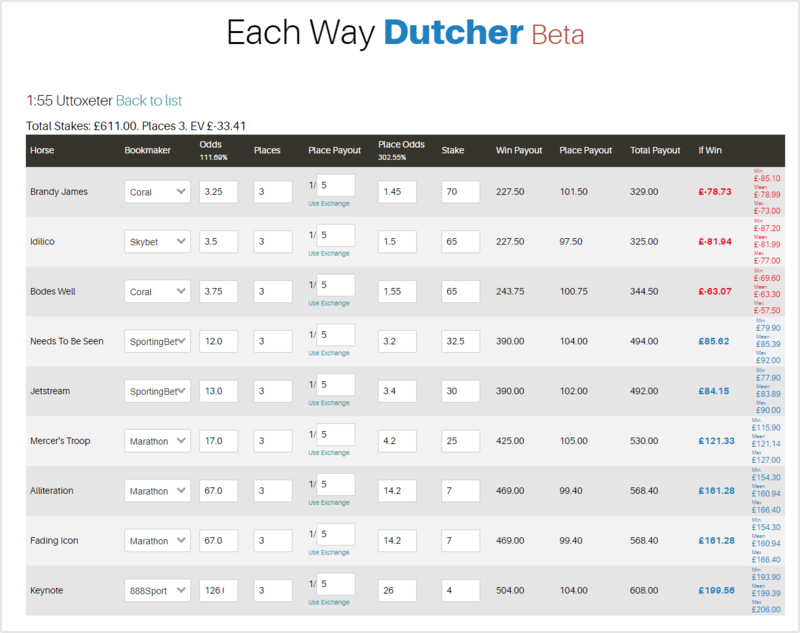 The Each Way Dutching tool is an advanced, yet easy to use tool that finds the best each way odds at various bookmakers for horses in selected races. It then displays the optimal each way stake in order to return a profit. There may be opportunities to lock in a profit by backing all runners but there are multiple opportunities every day which are +EV. This means that you may make a loss if certain horses win the race but as there is value in the given odds across the field, you will make an overall profit over time. You can filter the results displayed in the tool by bookmaker, country and date, allowing you to view dutching opportunities using bookmaker accounts you have access to. After selecting a race, the expected value is displayed along with the optimal each way stake for each horse at the associated bookmaker. You can also view the total payout should each horse win the race along with the total profit or loss should they do so. One advantage of Each Way Dutching is when Best Odds Guaranteed (BOG) is offered. Should you back a horse for which the starting price (SP) is greater than the odds you backed the horse at and the horse goes on to win the race, you’ll be paid out at the higher odds, thus increasing your profits. As you are backing all horses with this strategy, there is an increased chance that you will qualify for BOG should you back a horse that wins with a bookmaker which offers BOG.